I have been a patient at the cottage dental clinic for a number of years and have always found Sam and his team provide an excellent dental service and focus upon my needs as a patient. Sam and the team provide outstanding customer service, superb dental advice and care. Over the years I have had numerous dental treatments carried out by the Cottage Dental Clinic. 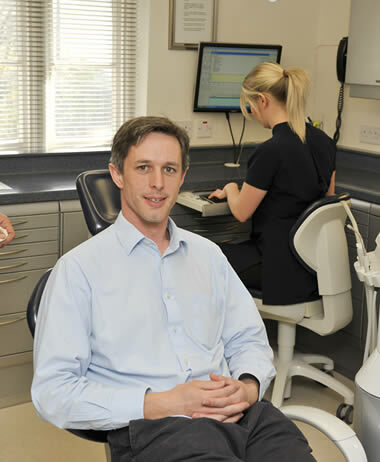 Sam and his team have overseen extensive work involving both crowns veneers and implants. All the treatment was discussed in depth explaining both costs and how the procedures would be carried out, all have been dealt with in a caring and informative manner, and the end result has me smiling every morning. Trust is a word that comes up time and time again when tell friends, I am also having Botox treatments carried out by Sam and the team, Thank you to Sam and his team. I have attended The Cottage Dental Clinic since 2004. I do not enjoy dental visits, but I have great faith in Sam and his staff, in fact I have recommended a few of my friends to him. My long term treatment has felt like climbing a mountain, knowing my smile will be there when I get to the top. Sam and his team have helped rebuild my life, confidence and smile with their combined professionalism and personal car and great advice. Thank you. The cottage dental practice is helpful, friendly and efficient, Sam is a very skilled and knowledgeable dentist and has sorted out my badly neglected teeth in an exemplary way. I would thoroughly recommend the cottage dental clinic, Friendly staff and the best healthcare makes for a great atmosphere and a great smile. Friendly atmosphere and comfortable waiting area. Prompt attention when needed and very helpful in sorting out any problems. I think the practice is a modern, very clean and friendly environment, it is comfortable and all staff that I have come across is caring friendly people. Sam is a kind man who takes into consideration peoples nerves and fears, he explains everything that that you need to know and what he is doing as your treatment and why. Since moving to royal Wotton basset I have attended the cottage dental clinic, I have found all the members of staff very professional. I find the treatment from this practice good it is very good. The practice has very modern equipment and provides excellent service for its patients. Sam takes a very pragmatic view of the patient’s dental health and always discusses any treatment and the various options to consider as a health plan. This practice is very pleasant to be in; the staffs are friendly and polite. I feel that it is a lovely dentist that is clean, tidy and welcoming, also my children are not afraid to go to the dentist who for a child can be scary, but because it is so friendly they are more than happy to go. Sam has been my dentist for over 10 years and I am very happy with the level of care I have received over this time, I have got confidence in Sam and the work carried out. I am a nervous patient but I am always made to feel at ease and comfortable during my appointments, the hygienist is very friendly and I am happy with the treatment that I receive, reception staff are friendly and helpful. THANKYOU!!!!! It is a spotlessly clean practice, the appointments are always punctual and the reception staffs are always professional and friendly and easy to contact. I feel secure in the Knowledge that the dentist is highly trained and professional. I have been with the practice for many years and when I needed an implant the process was explained to me in detail together with the other options available. The process itself went smoothly and as planned and I could not be happier with the result. I had an excellent and precise implant treatment with a very careful and understanding Implant Surgeon, Dr. Elmanharawy, who explained everything in minute detail every step of the way. I feel very confident that I have made the right decision for my own very serious gum problems, by having most of my teeth replaced with implants. My situation required the replacement of a very old bridged tooth, right at the front of my mouth Dr Elmanharawy explained all of the options in detail so that I could make an informed decision on the best course of treatment. This was then confirmed in a detail written proposal complete with costing. The surgery involved a bone graft due to the age of the damage and the contraction of the natural jaw bone. The whole process was carried out over a period of 6 months and I did not regret the decision at any stage or since. The end product is absolutely superb in both looks and feels I wouldn't hesitate to recommend Dr. Elmanharawy and Cottage Implant Clinic to anyone. In recent years, I have had two dental implants on two different occasions, both carried out by Dr. Elmanharawy. Both have been very successful and pleasing. Some discomfort involved but no pain, the treatment being very skilfully and carefully carried out. The end result is that I completely forgot that I have anything other than perfectly good, natural teeth, not being aware at all that the two are in fact implants and not my originals. Dr. Elmanharawy monitors the treatment throughout and his interest continues afterwards, ensuring that his implant work is the best possible. Well planned, explained and looked after through the whole implant treatment. I am very happy with the end result. Thank you. Thank you for the care and consideration shown to me during my implant treatment. They look and feel like my own teeth, giving me every confidence. I appreciate them every day of my life. I am pleased to have been a patient of Dr Elmanharawy since 2002. Thank you for the implant work completed recently. Your recommendation to replace a failed crown with an implant has proved wise and the work has been most successful. Before, during and after the treatment, you with your team have given high quality care and skill throughout. After careful explanation of the various alternatives I decided that an implant was by far the best treatment option for me in terms of aesthetic functionality and longevity. The procedure and costing were explained in detail and the treatment itself was carried out with exceptional care and attention. The result has been brilliant, everything I have hoped for. My experience with having my first implant was very good indeed. The process was pain-free and easy. I have had no problems at all and very happy with my “new tooth. Implant surgery was vey new to me, but I decided that this was the right option. I am very pleased with the outcome which has given me two strong teeth with an attractive appearance, and totally eliminated previous pain and discomfort. The implant procedure itself was pain-free, and carried out with skill and precision by Dr. Elmanharawy and his staff. I am very happy to recommend the Cottage Implant Clinic. Out of a list of ten possibilities, why did I pick the Cottage Implant Clinic. Simple, one word: TRUST. I knew the first time I met Dr. Elmanharawy that I could trust this person with what was to me a big and scary procedure. Due to my jaw bone being compromised, I required sinus augmentation and bone grafting procedures for the upper implants to be placed. This was clearly laid out in an implant report and treatment plan which was my road map for the procedure. Was my trust justified, yes, Dr Elmanharawy has what seems like a natural skill which gave me great confidence. Any regrets, yes only one, I wish I had the bottom done at the same time I had the upper implants done.